Nebraska Senator Ben Sasse speaks in Des Moines. Nebraska Senator Ben Sasse warned against false idols, political tribalism and an addiction to “24/7 news cycles” during a speech in Iowa tonight. 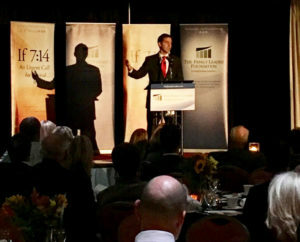 Sasse was the featured speaker at a fundraiser in Des Moines for The Family Leader, a Christian conservative organization. 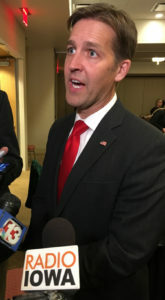 Sasse told the crowd elections can make the country “worse” or “incrementally better,” but Sasse suggested it was “almost a little bit un-American” to organize your life around two- and four-year election cycles. 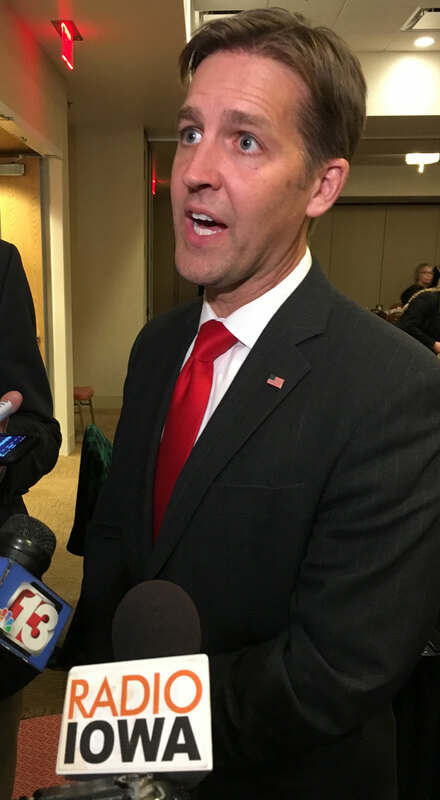 “America is made up of a people who think in decades and in centuries, not in terms of political addiction and political consumption and short-term-election ways of thinking about the world,” Sasse said. Benn Sass talks with reporters. State Representative Steven Holt, a Republican from Denison, was impressed. Norman Rozendaal of Monroe said he was “honored” to be in the room. Sasse told reporters after his speech that the country’s two major political parties have become — in his words — “crappy…brands” that have devolved into political tribes. Bob Vander Plaats, the president of the group that hosted Sasse tonight, started the evening by telling the crowd cultural change won’t be accomplished at the ballot box. The crowd of 550 applauded.